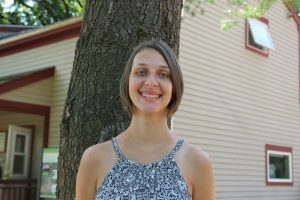 Emily joined Common Ground in the summer of 2016. She teaches chemistry and physics. She comes to CGHS from Boston Green Academy, an environmental charter school. She also taught chemistry courses at Boston University. Emily graduated from Boston University with B.A. in chemistry and B.S. in science education. When she isn’t teaching, Emily loves animals and enjoys reading, board games, and yoga. Contact her by email at emily.schmidt@commongroundct.org.